American rock gods, Foo Fighters, recently released their ninth studio album, entitled Concrete and Gold. For the last couple of years concrete has been a popular choice in the home (read my post on it here) and now, guess what? Gold is my choice for material of the year. Perhaps Dave Grohl is a design genius as well as a musical one? Yes, move over copper, there's a new kid in town. Although we've seen gold filtering its way back in to our homes via the accessories market, it's now being used in much larger areas (such as this blinging kitchen, above) and is once again a fashionable option for hardware and even - eek! - bathroom fittings. Gold is the perfect material for creating the Edgy Seventies Glam look I introduced you to in my previous post and it really makes a bold statement when used in such a vast expanse. Of course, it doesn't come cheap but it's a great way to add a touch of luxury. These are strange times we're living in and our homes are increasingly becoming a place to just hunker down and get away from the bad sh*t that's happening around the world. Why shouldn't we indulge ourselves? Although I've never been a fan and have always preferred silver I am being gently swayed. 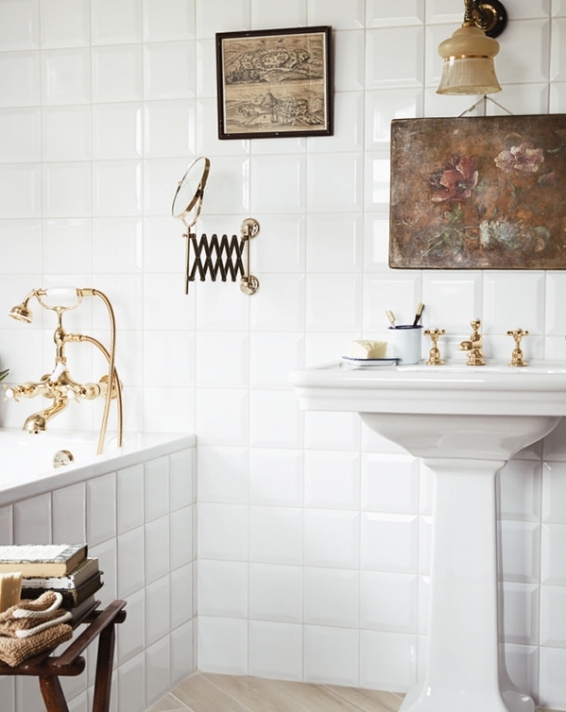 I'm accessorising with gold and brass in my living room and bathroom (albeit in small doses) and I have to admit it does add a certain warmth. There was a time when I thought chrome would last forever but now it just seems so dated. It's time to bring back the bling!